When working with Server and VMware people, there is a fair amount of misunderstanding of what is happening in the network. 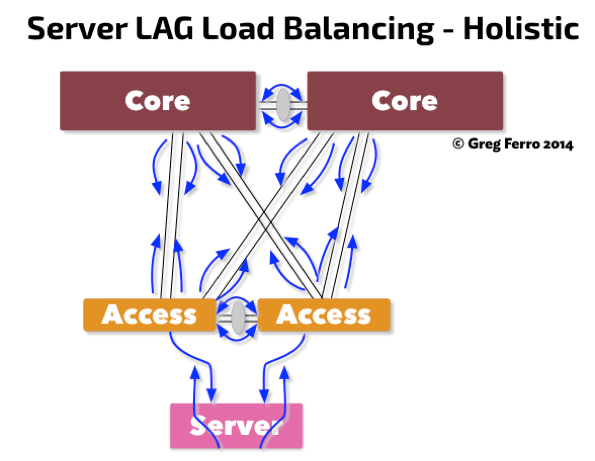 The best technical explanation for what is happening in LAG is, of course described at Ivan Pepelnjak’s IPSpace Blog – vSphere Does Not Need LAG Bandaids – The Network Does while Chris Wahl talks about the server side for VMware but I wanted to add something to the debate. People who work with vSphere, KVM or Hyper-V are often focussed on a single physical system – the server – and they perceivethe server connection to the network as something like this diagram. In fact, most server people only see Area 1 but some will perceive/understand that Area 2 exists. That is, the network load balancing is equally important as the server. And usually, just a few admins will understand that the paths in the dual homed switch architecture is some what more complex. They are able to consider the outbound and inbound traffic paths to a server. Consideration in Areas 1, 2 and 3 as show are all equally important. Even more vital, the network and server must have configurations that co-operate. I’ve occasionally used these diagrams in my regular consulting engagements to explain the end to end considerations to server folks which helps them to understand the complexity of the network. Configuring a server is often focussed on just one element or systems and server administrator fail to consider the bigger system because of that focus. 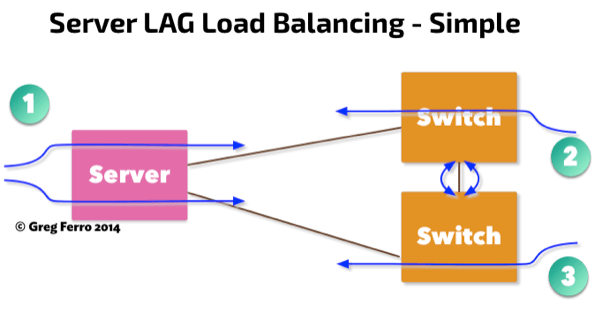 Equally, networking admins often forget that servers have to be correctly configured to load balance into the network. So a little overall understanding is helpful.